Dominion Marine Media vice president of technology Damir Tresnjo (left) and senior vice president Ian Atkins present the new DX1 software system to dealers on Monday night. 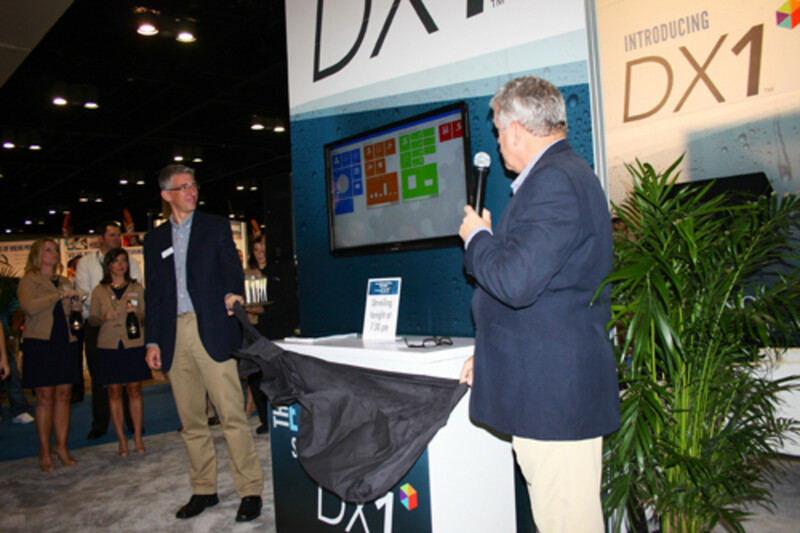 ORLANDO, Fla. — Dominion Marine Media used the Marine Dealer Conference & Expo to unveil DX1, the first cloud-based software system to provide end-to-end management of inventory, leads and sales for dealerships. "We believe this will revolutionize the way you do business," senior vice president Ian Atkins told a gathering at the company&apos;s booth in the Orange County Convention Center Monday night. "We&apos;d like to give you back 82 working days per year," Atkins told dealers, referring to an estimated time savings of 30 percent that they could gain by using DX1 rather than entering product and customer data onto multiple websites and managing the data over those platforms. "The problem in the industry is that each software provider tries to solve only a small slice of the [data management] problem," vice president of technology Damir Tresnjo said. "It&apos;s a common problem for a dealer to have to manage multiple websites with different passwords and then have to train their employees on the site. DX1 stops all the repetition." DX1 is still in the beta stage of testing and refinement, Tresnjo said, with an official launch expected sometime in the first quarter of next year. Dominion has been developing the software for 15 months with a team of 80 employees, making it "by far the largest R&D investment ever for Dominion Marine," he said. More than 200 companies are participating in the beta testing, including businesses in the powersports and RV industries. Palm City Yachts in Stuart, Fla., is the first and only marine dealer participating, although Tresnjo said a second dealership is expected to come aboard in a few weeks. "It&apos;s streamlined our business, said Craig Clements, president of Palm City Yachts. “From everything we&apos;ve seen, this will increase the number of leads we pursue."